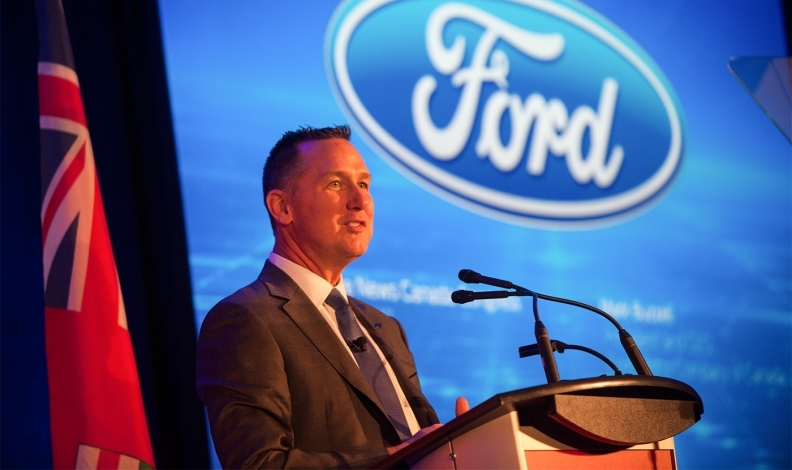 Ford of Canada President Mark Buzzell also said the company is gearing up for a radical shift toward becoming an “auto and mobility” business. Ford of Canada President Mark Buzzell said Canada is trying to position itself as a technology and innovation leader and the company is working closely with the federal government on projects including improving engine development at its two engine plants in Windsor, Ont. Ford promised last fall it would inject $700 million into the Windsor plants and its assembly plant in Oakville, Ont., as part of a labour deal reached with Unifor, which represents about 6,700 workers at the company's facilities. Speaking at the Vancouver International Auto Show, Buzzell has said this commitment has not wavered since the election of U.S. President Donald Trump. He reaffirmed his position on Tuesday, adding it would be unfair to speculate about Trump's protectionist proposals. He said it's too early to comment on the U.S. administration's proposal for a border adjustment tax on imports, but he said Ford chairman Bill Ford and CEO Mark Fields are communicating to Trump that the company supports free trade. He wouldn't comment on what they were hearing in response. He said the company is also working with Ontario Premier Kathleen Wynne and governors of Great Lakes states, as Ford facilities on either side of the border are highly interdependent. Buzzell also said the company is gearing up for a radical shift toward becoming an “auto and mobility” business. Buzzell said the company sees these trends taking hold and is responding with billions of dollars in new investments. While he wouldn't speculate on long-term hiring plans in Canada, he said Ford would still need a strong manufacturing workforce. Ford has already invested in San Francisco-based Chariot, which allows people to use a mobile app to hail rides on transit vans, as well as bike-sharing service GoBike. Last month, it announced $1 billion for a company called Argo AI, which is led by former Google and Uber executives and aims to develop a new software platform for Ford's first autonomous vehicle. "There's a lot of new disruptors or new players trying to get into this space," Buzzell said. "As our chairman Bill Ford has said, it's an interesting time when we need to figure out who's our friend and who's our foe. In some cases, they may be one and the same." The company is promising to have a self-driving vehicle, without a steering wheel or gas pedal, on the market by 2021. Currently, Ford is testing a fleet of 30 autonomous vehicles in the U.S. and aims to expand to 90 around the globe, Buzzell said. Ford has also invested $4.5 billion in electric vehicles to bring 13 new models to market over the next four or five years. "I think we can do a better job of creating awareness of the features and benefits these vehicles bring," he said. "Then I think we have to overcome some anxieties." Customers have "range anxiety," worrying that they will run out of energy, he said. But he said Ford is working to ensure more charging stations are available while piloting wireless charging technology in other parts of the world.